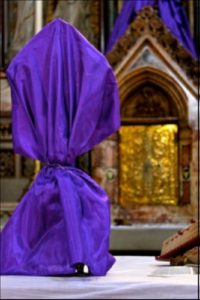 We sing Psalm 43 as our Introit on the Fifth Sunday of Lent (at the start of Passiontide). Originally composed nearly three thousand years ago, this melancholy psalm must have been written at a time of grave injustice and tribulation, as the psalmist pleads for justice against his enemies. To call upon the justice of God and to ask Him to render a verdict involves some risk. We might more naturally desire His mercy. And yet, there are times when indeed the people become so godless that the besieged and faithful remnant find themselves asking for exactly that: judgment and justice. Judica me Deus! Judge me, O Lord! For centuries priests recited words from the “Judica me Deus” at the foot of the altar. This became a kind of traveling prayer in the priestly preparation for Mass. This psalm expressed the priest’s holy fear before that sanctuary which he was approaching. The steps leading up to the altar reminded the priest of ascending to Jerusalem, so before he ascended to perform his sacred duty, he declared his desire to render thanks to God without expectation of reward. Boldly the priest was also asking God to judge him, but also to distinguish his own cause from the iniquities of his age. Entering again into Passiontide (and these last days of Lent) with its even greater emphasis on penance, many of us can relate to the ”Judica Me Deus” today. Too many within our world, nation, and Church have lost all fear of God. It is as if everyone does exactly the opposite of what the Church and the Lord asks us to do, and without shame. Whether it is in liturgy or morality, we are evidently incapable of doing God’s will. Too many of the bishops and priests don’t teach or uphold the Faith. Too many of the faithful simply surrender to the spirit of the age, and stop going to Mass or living by the teachings of the Church. Meanwhile, our kids are left to try to make sense of it all. It reminds one of the time of Samuel in the Old Testament. Samuel was raised by a priest who understood how deeply his own priestly caste needed reform. Samuel was the last of the judges. He anointed the first kings, even as he warned the Israelites that having kings over them would not be the solution to their problems. And with his prophetic voice, Samuel pointed to the future Messiah, the Son of David and the Son of God, who would be exalted by God. And yet so many in our depraved age of apostasy live as if Christ is no longer important. We refuse to honor God. We mock goodness. We suppress the truth. We ignore doctrine, and then presume to change it, and make good bad, and bad good. The impiety of our age cries to heaven so much so that some may wonder how God has stayed His hand this long. Since we are all baptized into the priestly office of Jesus Christ, we each need to pray on behalf of our people, and to pray for mercy. But let the “Judica Me Deus” remind us all that we will be judged, so we need to have the courage all the more to live our Catholicism in this dark age.